Sara Topham (Titania) and Tim Campbell (Oberon) rehearse with director Ethan McSweeny. “It’s possible that the most challenging design question in the Shakespeare canon is ‘What do fairies wear?’” claims director Ethan McSweeny. 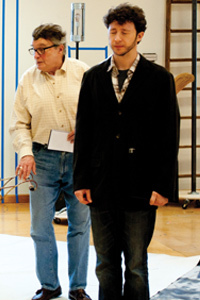 Ted van Griethuysen (Peter Quince) and Adam Green (Philostrate/Puck) rehearse. It’s a tall order for a play that has some very famous incarnations. Most memorable—and still spoken of in theatrical circles—is the Peter Brook production that premiered with the Royal Shakespeare Company in 1970, then toured the world. Performed in a stark, white space, it featured trapeze perches for Titania and Oberon, and actual spinning plates, along with other circus paraphernalia. The duo’s vision evolved from an early image of an empty neoclassical room to arrive at a more fully-fledged abandoned theatre, a setting that offers a natural journey from reality to fantasy. Thus the Athenian scenes take place before the stage curtain, close to the audience’s own world. Those curtains part to reveal the world of the Mechanicals, set within the confines of a dilapidated theatre. When the massive rear doors at the back of the stage open, the magic of the forest overtakes the space. 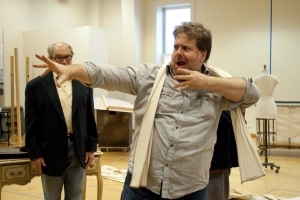 Ted van Griethuysen (Peter Quince) and Bruce Dow (Bottom) rehearse. McSweeny finds the duo particularly fascinating, and particularly contemporary. “Oberon and Titania are a married couple in the midst of a custody battle. They struggle, they blame each other, they wait to see who will give in.” It’s left to Puck, played by Adam Green, to run interference between the quarreling spouses. Bruce Dow, playing Nick Bottom, leads the troupe of Mechanicals. “I first saw Bruce play Trinculo opposite Christopher Plummer in the Stratford Tempest,” McSweeny recalls. “I thought his was one of the most brilliant comic turns in Shakespeare I had yet seen.” McSweeny placed Dow at the head of a veteran troupe of actors, as skilled in real life as they are bumbling in their stage personas.